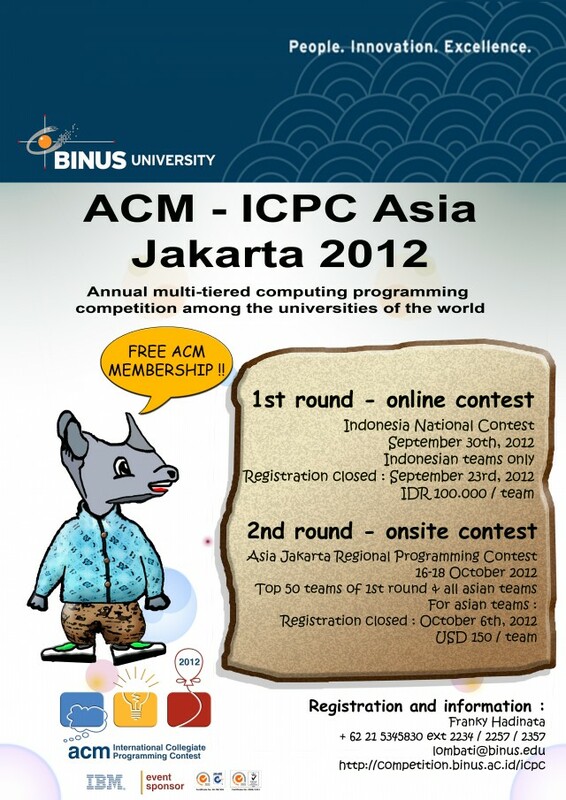 ACM International Collegiate Programming Contest (abbreviated as ACM-ICPC or just ICPC) is an annual multi-tiered computer programming competition among the universities of the world. The contest is sponsored by IBM. Headquartered at Baylor University, with autonomous regions on six continents, and operates under the auspices of the Association for Computing Machinery (ACM). The contest involves a global network of universities hosting regional competitions that advance teams to the ACM-ICPC World Finals. Participation has grown to several tens of thousands of the finest students and faculty in computing disciplines at almost 2,000 universities from over 80 countries on six continents. The contest fosters creativity, teamwork, and innovation in building new software programs, and enables students to test their ability to perform under pressure. Quite simply, it is the oldest, largest, and most prestigious programming contest in the world. BINUS UNIVERSITY (web.binus.ac.id), which has moved toward a world-class university, would host one of the Asia Regional Contest. This year is the third time BINUS hosts this most prestigious programming contest in Asian region. Hopefully, by holding this contest, it would give more chance to Indonesian college students to take part and get more experiences. This year winner along with other 100 teams from all around the world will advance to The 2013 ACM-ICPC World Final, held at St. Petersburg, Russia. Indonesia National Contest is National Programming Contest that acts as the online preliminary round for all Indonesian teams to advance to the Regional Asia Jakarta Contest. Indonesian teams will be challenged to a set of 5-10 (fixed numbers to be confirmed) problems to be solved in 5 hours. The problem sets will be solvable using programming languages such as C/C++ or Java. The contest will be held online on September 30th 2012 at 10:00 until 15:00 and the trial contest will be on September 29th 2012 at 13:20 until 15:00. Top 50 of the contest will advance to the Regional Asia Jakarta Contest on October 16th – October 18th 2012. Pengukuhan Guru Besar Prof. Dr. Widodo Budiharto, S.Si., M.Kom.